Is it bad that I am already counting down the days to fall and football season? This past season at Bryant-Denny was amazing to say the least. This season I'll actually be working during games (It's something football related! ), so I figured because my game day experiences will be a little different in the fall, I would share with y'all my essentials for game day. I am definitely going to be living vicariously through everyone else's game days, but don't worry; I am super excited for what I am doing in the fall. 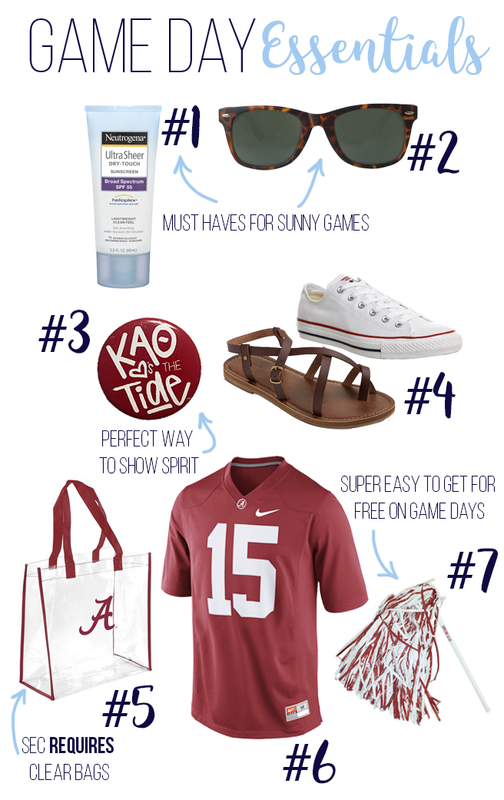 Today I am sharing my game day essentials, and these are probably better suited for a game day down South, but that's the only one I've ever experienced! Sunscreen | This may be an obvious to some, but I swear, everyone I know got sunburnt during our first home game. I wore a face sticker to the first game, and I had a script "A" burnt onto my face. Not a super cute look. Sunscreen is super important, especially if you're a freshman at Alabama!! Freshmen normally sit in the upper section of the stadium where there is basically no shade. During the Kent State game aka the hottest game on record, one side of my back got sunburnt, and 11 am kickoffs are not friendly to those of us with pale skin, Let's be real, neither is skin cancer. Sunglasses | Along with sunscreen, this might be another "duh," but I promise you, just remember your sunglasses for the morning games. Your life will be better because of it. Personally, I always brought my cheap Target sunglasses because I didn't mind if they somehow got lost or broken while I was at the game or the tailgates. Game Day Button | I know this is really big thing down South, but all the sorority girls wear buttons with their letters on them and their team name. 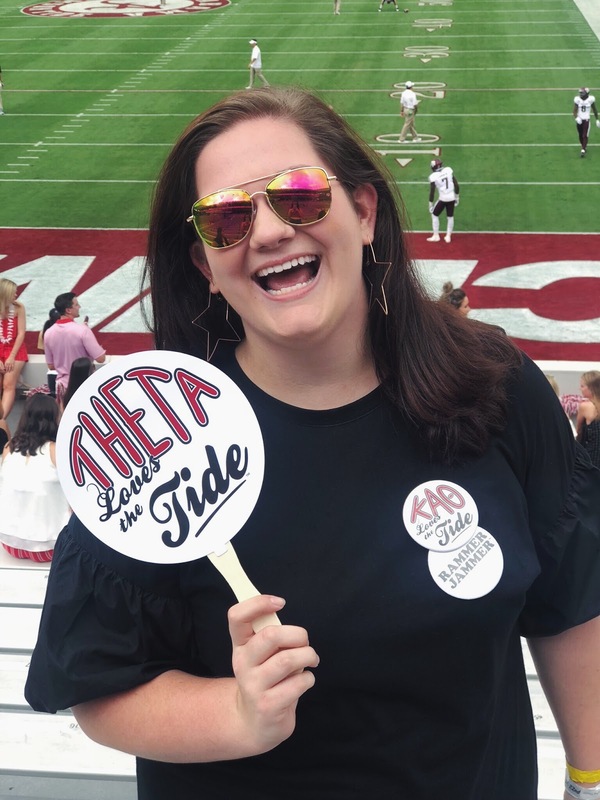 I loved wearing my "Theta Loves the Tide" button every weekend, but even if you're not in a sorority, you can still wear a game day button. A lot of them have funny sayings on them or say "Beat *Team Name Here*." You can pretty much get one anywhere that sells Alabama fan gear in Tuscaloosa, so I imagine it's the same on other campuses, and if you're in a sorority, you'll be able to get one from your t-shirt chair before the season starts! Comfortable Shoes | Like I said, at Alabama freshmen sit in the very upper section of the stadium, and it's a hike to get there. For the love of your feet, wear comfortable shoes. You have to commit to the shoes you wear to a game because taking them off is not an option. 1. It's not a cute look, and 2. you have no idea what's on the ground in or around the stadium. My favorites options are these sandals from Target or Converse or comfortable boots once it gets cold. But if you really want to wear your super cute wedges, wear flats to the game and bring the wedges in a bag with you and change once you reach upper bowl. This is something I've actually seen a girl do, and it's pretty smart in my opinion. Clear Bag | Speaking of bags, if you are going to a SEC school, you have to have a clear bag. This is something the conference implemented recently, and it's modeled after the NFL policy. (I know some Big10 schools won't even let you bring bags in.) You can get a clear bag almost everywhere during the season, or you can order one so you're prepared rather than scrambling to find one during the weekend. However, if that's not your style/you don't carry that much stuff, I recommend the New Stadium Crossbody from Barrington, which is designed specifically with the stadium regulations in mind. Jersey | In the South, most girls wear super cute game day dresses, but personally, I was all about wearing my AJ McCarron jersey last season. (It became my lucky jersey after I put it on during the second half of the Ole Miss game.) Jerseys are super great for away games, super hot games, and spring games. Jerseys are a also good staple for college in general too because they work for like 85% of the themed events you'll have. Obviously generic team ones are going to be cheaper, but I loved having a player specific one, especially because McCarron was one of the reasons I started liking Alabama football. Shaker | There's no reason to buy one before the game because you can easily find one in the stadium, especially for the first game of the season, and I promise you they will pile up in your dorm by the end of the season. I think I brought home like 5 or 6, and I swear only two of them are actually mine. Stick 'em in your boots. Stick 'em in your pockets. Just make sure you have one because singing the fight song is a whole lot more fun when you have one.